Catering is all I’ve known since the age 14. I have worked in kitchens from pot wash to catering manager positions on large sites and all areas in between. It all stems from my passion for service quality, the love of food, its ingredients and how they can be applied to complement each other, and the science that surrounds it. 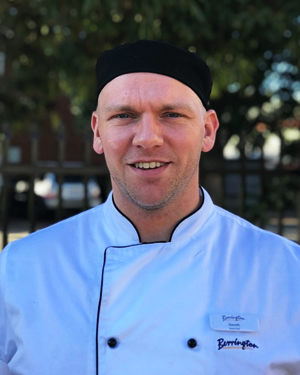 Chef Gareth is passionate about providing residents with five-star meals that make their overall experience living at Berrington to be a fantastic one. Chef Gareth graduated from Oldham Tech College in 2002 as a qualified chef. He earned a Certificate I and II (City and Guilds Food preparation and service), which has been TRA Certified. He also earned a certificate as a Food Safety Supervisor. He’s about to start a Certificate T & A, and a Certificate IV in Food Science. He keeps abreast of the latest in food trends and can apply his skills in an array of culinary environments. He chose to work at Berrington as he appreciates the exceptional quality and service that we provide to our residents. If you would like more information about the meal offerings available to residents at Berrington, we invite you to contact us today!